Our new blog series for the remainder of the summer is a history of music for singers. This isn’t meant to be a “history of singing”, not least because it’s a fairly under researched area. Instead, I want to touch on some of the changes and developments in music that affect us vocalists. 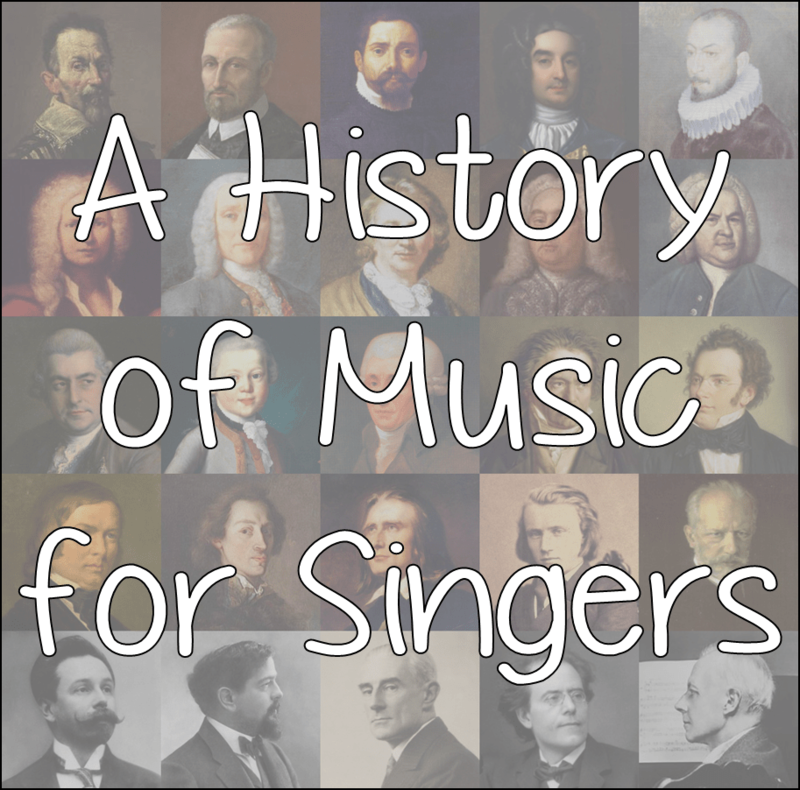 I’m also planning to highlight some key composers of vocal music, which may or may not be the ones you’d expect to hear about for each time period. Following on from this series, I plan to have a composer of the month beginning from September. Each month, we’ll feature a composer, including a brief post on his or her life, and one looking at the fingerprints of his or her vocal music. For that month, the “history of music binder” pages for our composer of the month will also be available for free download. After that, you’ll be able to buy them from my (soon to be launched) resources shop, either individually, or in a range of bundles. Music in human culture almost certainly originated with the singing voice. Some people even claim we might have sung before we spoke. Whether or not that’s true, singing had practical uses for early cultures. Have you ever tried comparing singing with shouting over long distances? Singing caries further. That’s why yodelling developed in the Alps! We don’t know much about early singing, mainly because there’s very little evidence. The soft tissue of the body doesn’t last very long after death, and there’s not much in the way of music that’s been written down. Nevertheless, we know that early civilisations like the Egyptians, Greeks, and Romans all had cultural practices which included singing. The Jewish culture at this time was also rich with song – the Old Testament contains many of the lyrics of songs which have become poems now that the music has long been lost. There are only tantalising references in the book of Psalms to the instruments use to play it, or the composer. Coming, as Christianity did, out of Jewish culture, the early church also used music and the voice as part of worship. At first, these were borrowed from the Jewish music, but as Christians spread across Europe and the globe, so they adopted other local styles of music and made them their own – and they’re still doing it today! Most of the evidence for how singing sounded at this time comes from drawings in manuscripts. It seems likely from the descriptions and pictures that singing was quite nasal in sound – very twangy. I imagine it sounding a lot like very bad country music that’s sung all on one note…was largely based on fourths and fifths as those intervals are very stable – they’re “perfect”. The third or “triton” could be major or minor, and thus was considered to be the devil’s music! Here’s an example of plainchant from the 11th Century, sung by a modern day professional tenor. As harmonies grew more complicated, the need for a wider range of voices grew. The church couldn’t bring itself to allow women to sing, as they believed it was banned by the bible. Instead, they allowed boys to train as trebles for church choirs, just as they still do today. There were, of course, disadvantages to this as boys do eventually grow into men. This led to the use of castrati: men who have had their testes removed to prevent puberty, and thus their voice dropping. Unpleasant, but it did allow greater variety and experimentation with choral music. Alongside these changes in church music, secular music developed more complicated forms. One very early example of non-church music is the round “Summer is Icumen in”. Rounds were a popular form for medieval songs as they were easy to learn and could be sung both by individuals and by groups (probably in the pub…). By the end of the medieval era, as the Tudors in England and Stuarts in Scotland were ascending their thrones, vocal music had developed into a more melodic and harmonious form than ever before. Meanwhile, on the continent of Europe, the rebirth of science and art was beginning to take hold. This was the Renaissance, and it marked the true beginnings of what is now called “Western Art Music”. 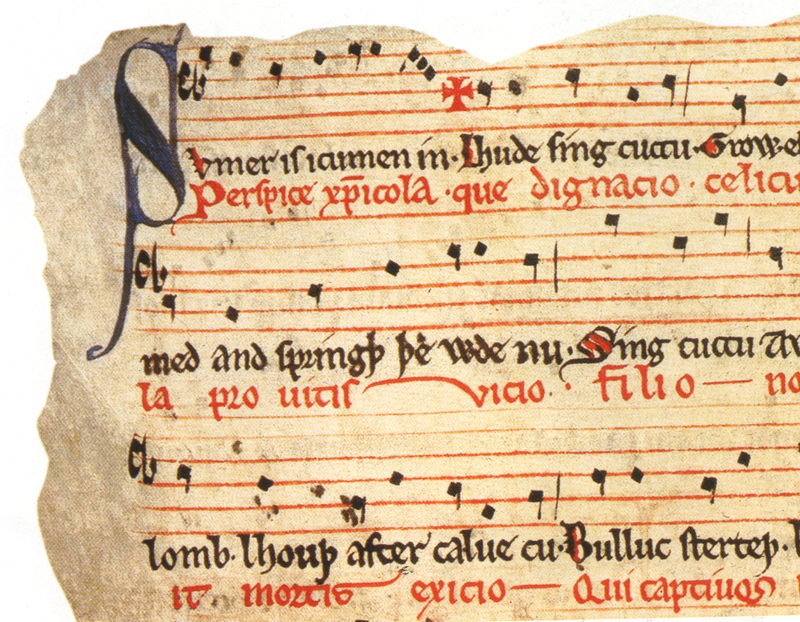 This entry was posted in History of Music and tagged history of music, medieval music on 24th July 2013 by .